Moisture and humidity can wreak havoc with your area rugs.This is especially evident during hot summer months with heavy periods of rain. You may notice odd smells in your house. 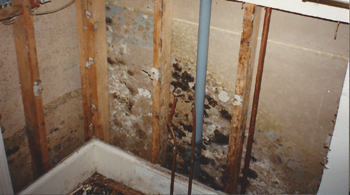 You may begin to suspect mold or mildew. That pungent odor may be coming from the urine problem you thought was gone. 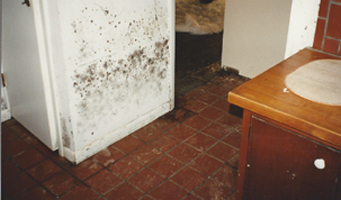 When any of this occurs, it may be time to check your area rugs for moisture damage. Get up close to the fibers and take a whiff. Check the backs of the rugs as well. If you notice any suspicious odors, it is time to get help. For some rugs, it may be difficult to determine if there is moisture present because rug fibers such as wool can absorb up to 30% of their weight in water and not even feel wet! If you know there has been moisture and high humidity in your home and you have begun to notice any suspicious odors, play it safe and schedule a pick up or bring in your rugs as soon as you are able. 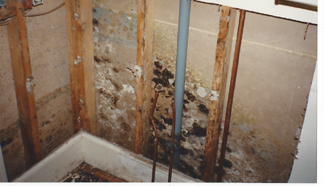 MOISTURE and HUMIDITY CAN CAUSE A MULTITUDE OF PROBLEMS! A buildup of moisture and humidity in any rug, even a synthetic one, can cause a multitude of problems, not the least of which is mold or mildew. 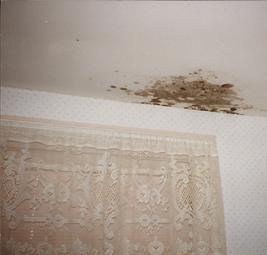 Besides exacerbating odors, fungal growth (such as mold and mildew) can permanently stain textile fibers. Bacterial growth from excess moisture and humidity can quickly reactivate urine odors and stains as well. The treatment we use in our ABC cleaning plant for odors caused by moisture and humidity includes the process of sanitization followed by a thorough cleaning and drying. This process will remove bacteria from the pile of the rug and produce a residual effect that will continue to destroy bacteria for up to 6 months. One of the main causes of offensive urine odors is the ammonia gas which is released by decaying urine. (Fresh urine typically has little odor). Natural bacteria will attack the urine as it breaks down and will digest the urea and other chemicals it contains. The end result of the digestion is phosphate salts (microscopic urine crystals) which attach themselves to fibers and cannot be removed by cleaning alone. Moisture and humidity, whether from climate related sources or episodes of urine deposited from a warm animal’s body, release the urine from the salts and the process starts again. A sanitization treatment will merely slow down the process. A special, labor-intensive soaking process is needed to permanently remove the urine salts and the odor. This is the urine-decontamination process we use in our ABC cleaning plant. Our urine treatment will remove urine odors, but not the stains. Urine itself begins as an acid but the salts that remain are alkaline. If they are not treated, the salts can strip the fiber of red and blue dyes, leaving only the yellow dye. 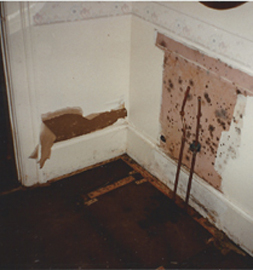 This is the urine stain and it cannot be fixed unless it is re-dyed. Moisture and humidity may cause problems with your rugs, but If you have experienced flood waters in your home, you must get professional help as soon as possible to remove the water and bacteria-laden ground water in your home. 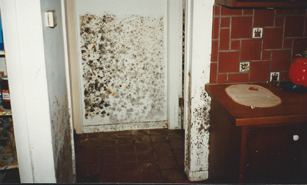 Bacterial action causing mold can occur very quickly under these circumstances and an application of a disinfectant will be necessary. 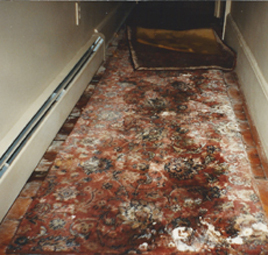 Although we no longer provide damage restoration services, our cleaning plant is always ready to receive wet area rugs for cleaning and restoration. 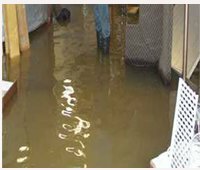 If you would like more information on how to handle flood intrusions, please read Flood-3 Steps to Take Right Away, Flood Damage Restoration, and Flood Damage Remediation. Please call our office as soon as possible if your rug(s) have gotten wet. If you intend to bring a wet rug to our plant, be very careful how you fold or roll it. If you are rolling a wet rug, listen for cracking noises indicating the foundation may be compromised. In that case, you could gently place the rug on a tarp or heavy plastic and then carefully roll the rug using the plastic. You could also just gently fold the rug. If you would prefer, we would be happy to pick up your wet area rugs and bring them to our plant for treatment and cleaning. They will need to have any excess water extracted and they will be disinfected. The rugs will be dried in our temperature controlled dry room before they are thoroughly cleaned on both sides and hung to dry again. A wet rug is already saturated. The fibers will not be able to accept cleaning solutions and treatments and the necessary thorough rinsing. Thus, the rug cannot be properly cleaned until it has been thoroughly dried. It is extremely important to call as soon as possible to avoid the multitude of damages your rug could incur from the water damage. Our cleaning plant personnel are prepared to do whatever is necessary to treat and clean your area rugs for excess moisture and odors. 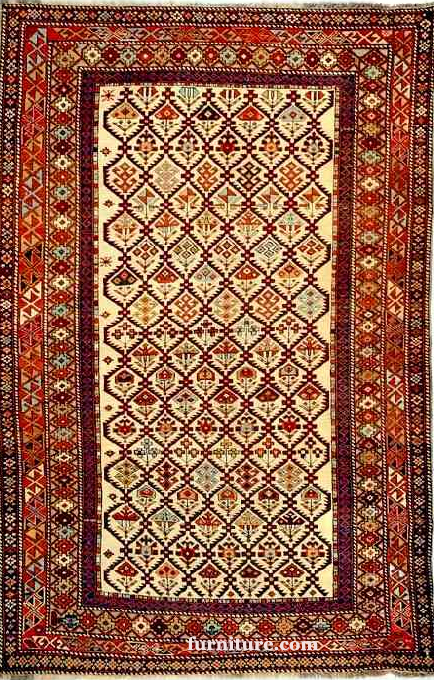 Your rugs will be thoroughly inspected and all charges for the best possible way to restore them will be explained to you. If the damages include repairing areas of your rug, we will also be able to outline the most cost-effective way to return your rug to its former beauty and usefulness. At ABC, we have over 100 years of combined experience in the rug cleaning and restoration field and we are always ready to apply our knowledge in order to restore your dirty or damaged rugs to their best possible condition. Our phone number is 607-272-1566. We are open from 8 to 5 Monday through Thursday, closing on Fridays at 4:30pm. We are also open every Saturday from 10 to 1. You can also find us on Facebook. 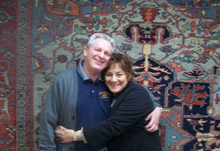 We look forward to helping you with your area rugs!